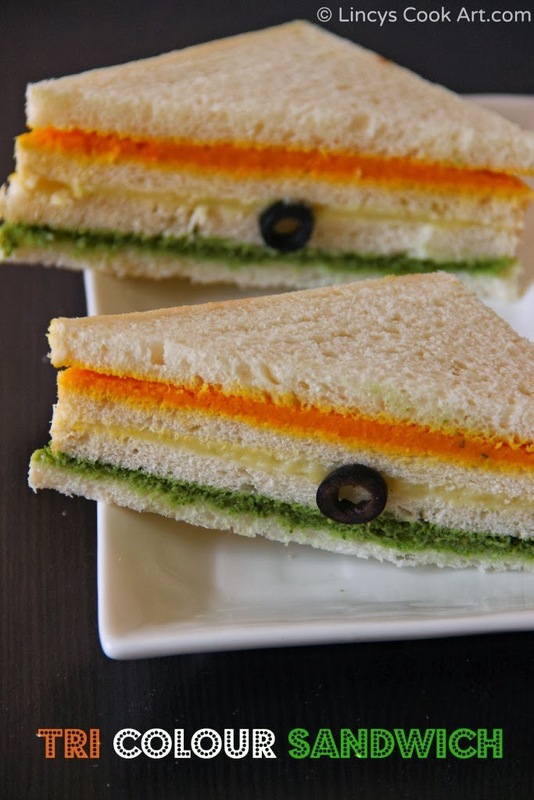 I have made this Tri Colour Sandwich for the Indian Republic Day. I have used three veggies in each layer to make the sandwich to match the republic theme and also make it healthy. For saffron layer i used carrots, for the white layer potatoes and the green layer cucumbers.You can use the veggies of your choice that suits the colour theme and make this sandwich. I have made like carrot chutney and cucumber coriander chutney by adding coconut in two layers. People who wish to avoid coconut in their version, use boiled and pureed veggies and mix with mayonnaise or butter; season with pepper and salt. In the middle layer, you can skip mashed potato and simply apply Mayonnaise also. I have not applied butter in this sandwich as this sticks together. You can apply butter also for kids in each layer of the bread. In a pan add a teaspoon of oil and add the red chilli and the carrot and sauté till the raw taste of the carrots leaves as they should not loose the vibrant colour of the carrots. Allow to cool. Set aside. In a blender jar add the cooked carrots, red chilli, roasted channa dhal, coconut, garlic and salt and and blend as a thick fine paste to spreadable consistency. Pressure cook the potato till soft peel the potatoes and mash it. 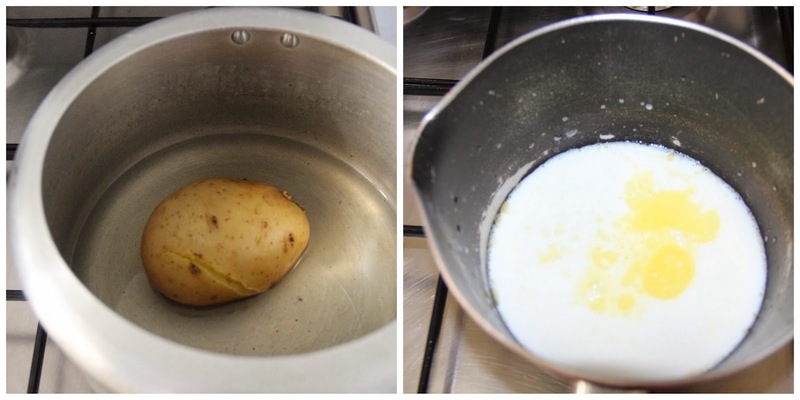 In a pan add the butter and when it starts to melt add the milk and bring it to boil. Now add the mashed potatoes and mix well and beat well without forming lumps. Season this mixture with pepper and salt. Switch off the gas. Again in a blender jar add the cucumber, coriander leaves, green chillies, channa dhal, coconut and garlic as a fine paste to spreadable consistency. Apply the chutnies and mashed potato in each slice of bread and keep a plain slice on the top over saffron layer. Slightly press the sandwich and trim the edges. Diagonally cut the slices to get triangular shape or cut rectangle shape as you wish. For all the three layers you can alter the veggies of your choice. Add very little amount of coconut and roasted channa dhal as it dilutes the vibrant colours. Wonderful tricolor sandwich .Kids will be impressed after seeing it . Wonderful presentation. Very delightful sandwich. Like the idea of making chutneys.....colorful sandwiches! Sandwich looks amazing 😊 tempting clicks ..
yummy sandwich filled with flavours and colours .Thanks so much for linking to my event.Looking for more..